are inquisitive and want to explore the limits of the worlds known to them and beyond. Through their courageous adventures we can see what drives them into unknown and unforgiving lands, facing almost unimaginable challenges and risking death. One of the great explorers of our time, Sir Ranulph Fiennes wrote this email of support and encouragement to Ed Stafford, the English explorer whilst Ed was on his mission to become the first man to walk the entire length of the Amazon. Congratulations on your progress to date. I think things will get increasingly difficult for you. Over forty years I must have been involved with over thirty big journeys, at least half of which have failed. It is always a matter for the traveler to decide in his/her own head when to turn back and when to continue. Sometimes to continue is plain daft and irresponsible, at other times there is a chance that pushing on over a particular obstacle or series of obstacles may make things look a whole lot better in which case it's well worth fighting off the 'weak thoughts' which occur when morale is down. Only you can be your own final arbiter. Whatever you may decide over the weeks/months ahead, know that you have already done fantastically well and we at the Transglobe Expedition Trust are proud of you. Failure is something the entrepreneur needs to be very comfortable with because without it you'd never start in the first place. Risk taking, whether you love it or hate it, is part of the package and is a one of pillars entrepreneurship stands on. Intuition and keeping counsel, not just when to turn back and when to continue, but also when to able to pivot as an unforeseen opportunity presents itself. Adventure is what happens when planning goes wrong, and many a business has catapulted into a direction that was never part of the original plan. Courage to start is required and yet in some ways even more so is to acknowledge that to continue is irresponsible, to your vision, your team and potential new adventures. Tough times don't last, tough people do. This approach can be a useful aide when obstacles need to be surmounted. Develop and build a skill set, routine, perspective, whatever it takes on the days you need to pull up your socks and just get on with it. Entrepreneurs are human and morale will fluctuate, particularly when endless hours of effort are not producing the desired results. Weaker thoughts will occur, so build your strength of character and at these times draw on those who fully know your merit and whose judgment you trust when your own may be clouded. Acknowledge your success regardless of if you make it to the end. Remind yourself that you did not play it safe for the regular monthly paycheck whilst in a job that every day killed the very soul in you. Often the success is that a vital lesson was learnt that impacts on the next venture. Hardly surprising then that Bill Gates' favourite business book is Business Adventures, sharing the drama and adventures of Wall Street and that Sir Richard Branson has just launched a mission to uncover how America's brightest business leaders make their business adventure one that makes a difference to people's lives. It was over. Nine million odd steps; over 200,000 mosquito and ant bites each; over 8,000 kilometres walked over 860 days, 733 if them with Cho, about 600 wasp stings; a dozen scorpion stings; 10 HD video cameras; 6 pairs of walking boots; 3 GPSs and One Guinness World Record. My chest swelled with pride and satisfaction. It was a day I will never forget for the rest of my life. No one would ever take that away from us. 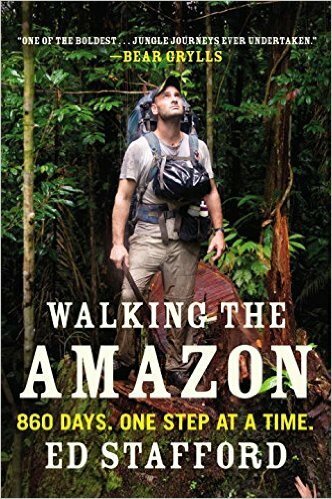 Ed Stafford, Walking the Amazon 860 Days. One step at a time. So let's make it epic!! !